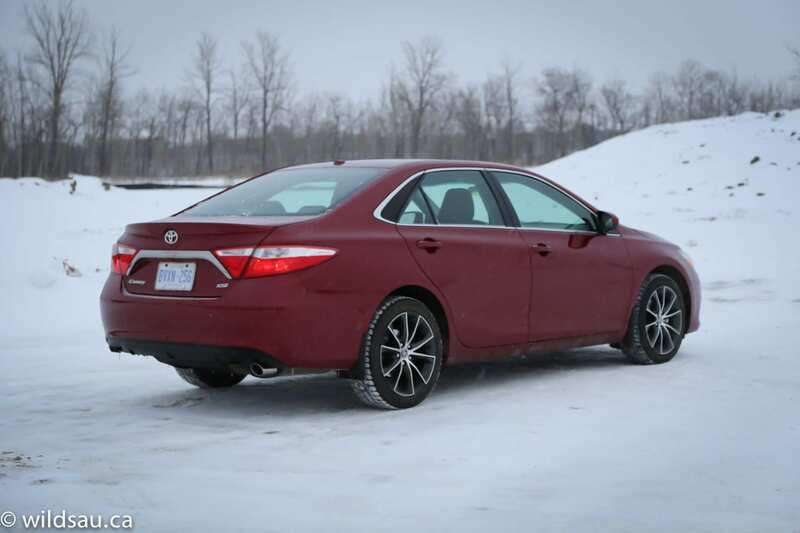 The best-selling Camry got a bumper-to-bumper redesign for the 2015 model year. 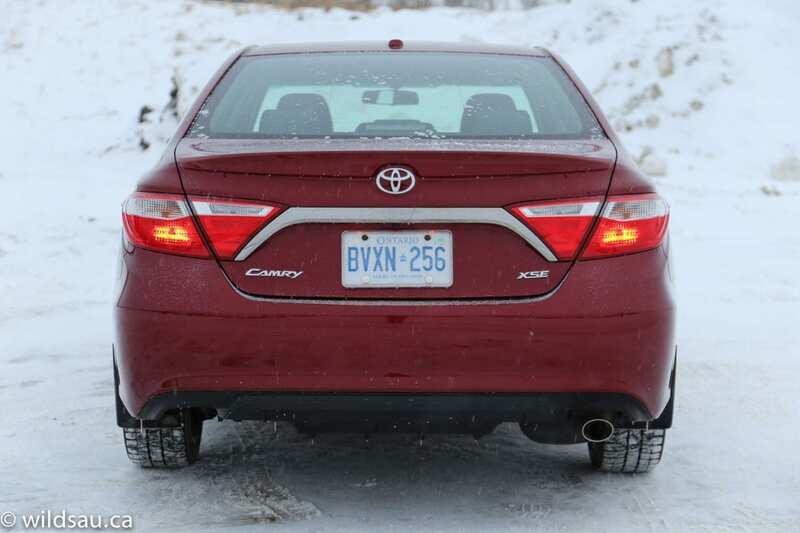 It wasn’t long ago that I was talking about the Camry as a great but bland car. 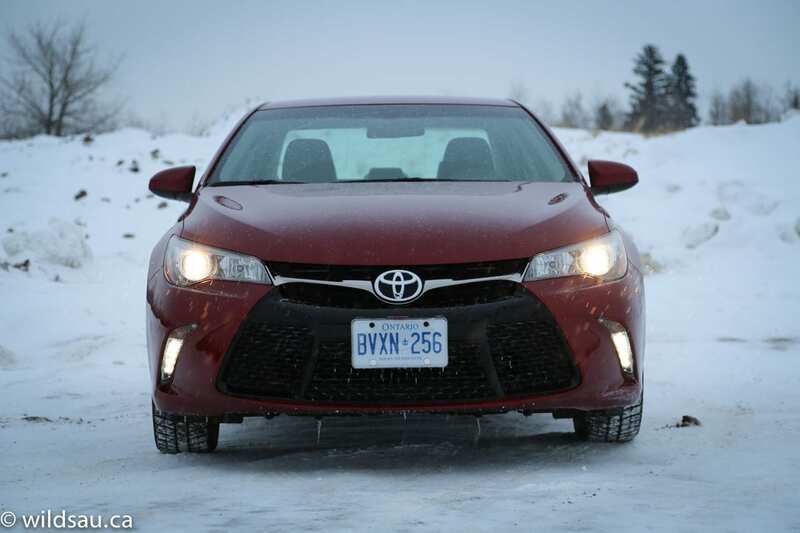 Toyota tells us that it got more style, more comfort and more driving fun. Let’s see if they’re telling the truth. I got the new “sportier” XSE model as a review car. 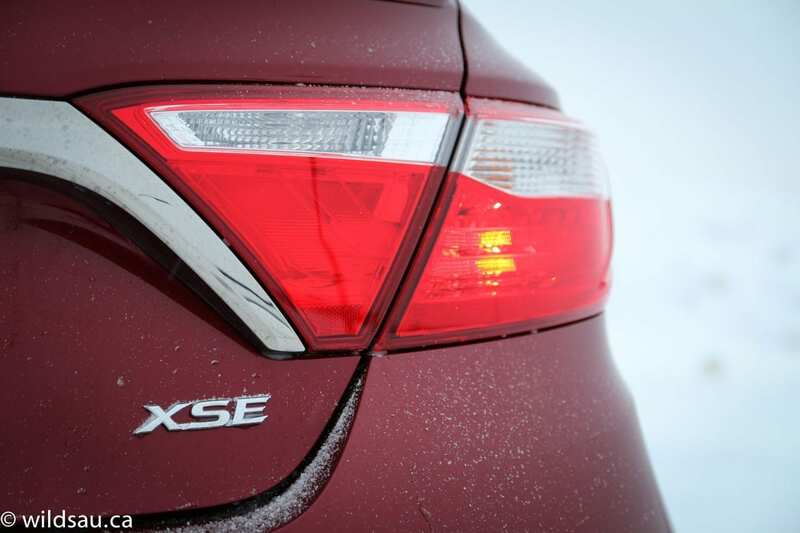 The new XSE trim benefits from the Camry’s new styling as well as some bold XSE-exclusive enhancements. The car is pretty striking in Ruby Flare Pearl, a new colour. Add to that the edgier look from the surprisingly bold and somewhat unexpected front end with a wide mesh grille and aggressive-looking vertical LED driving lights (which have integrated turn signals). The XSE also sits on fat 225/45-sized rubber wrapped around 18-inch rims. You’ll find plenty of other new things to look at – the roof is the only panel that remains unchanged. While it’s still a Toyota sedan (take that as you will), the new styling is unquestionably more expressive and gets some notable character lines on the side. The rear profile is probably the most boring part of the car. They’ve also made it longer and wider, though I’d argue the new packaging makes it look slightly more tidy and compact. I found the new Camry to be the best looking one yet, and quite enjoyed the new styling exercise. No, it’s not a great looking car that excites me, but there’s absolutely nothing wrong with it. 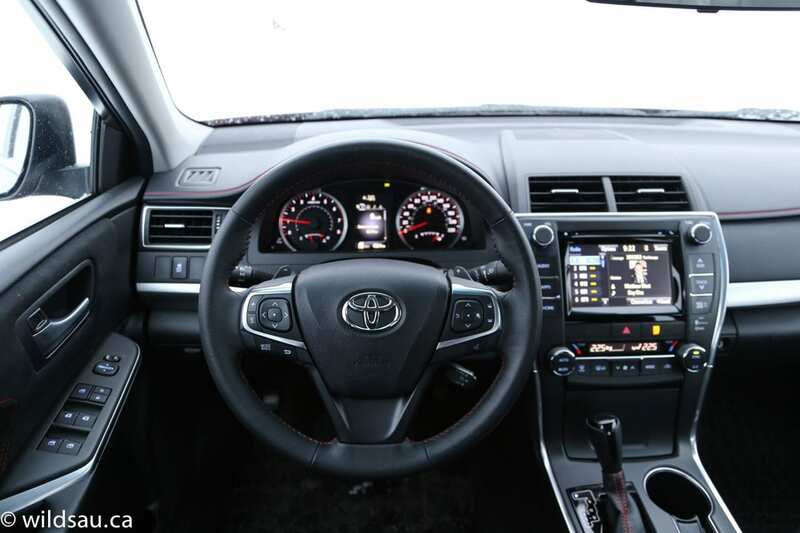 Looking around the Camry’s very spacious cabin – front head room is incredible – I found materials that are decent and attractive. 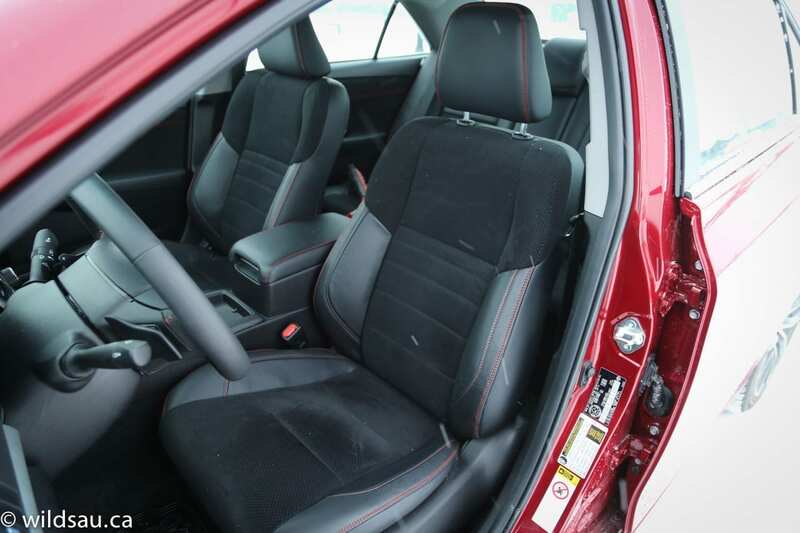 The soft-ish plastics are nicely textured, and they’ve thrown in contrasting red stitching on the seats and door panels. How sporty! The styling is clean and attractive, if not exactly avant garde, but it all comes together looking nice and working well. Ergonomics are excellent. 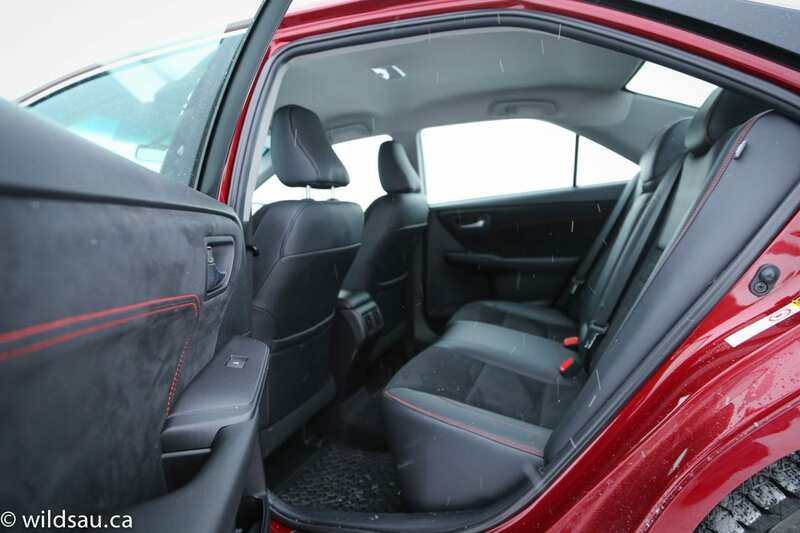 The heated and power-adjustable front seats have sweet Alcantara inserts and are very comfortable. I was surprised to find decent bolstering for more aggressive driving. What’s going on with you, Toyota? Are you feeling OK? The chunky steering wheel feels nice in hand, and behind it (splitting the gauges) is an excellent 4.2-inch driver information screen that offers up a ton of information quickly. The dash’s focus is a 7-inch touchscreen with large buttons on the side to access its major functions. The user interface is intuitive and works well, although it’s not the prettiest thing in the world. All navigation, phone, media functions are handled here, as are your vehicle settings, fuel economy history and the back-up camera – the only driver assistance tech you’ll find at this price level. I found a cool detail and a neat way to customize the vehicle. It’s called Driver Settings and allows you to link your paired Bluetooth phone to your preferred settings for audio presets, button colours, etc. and when the car recognizes your phone, the vehicle will return to all your memorized settings. Likewise for other drivers. As you’d expect, there are three seats back here. I am not exaggerating when I say the head room and leg room are simply amazing. Plenty of space for big and tall people, and even the narrow middle seat could be usable for an adult passenger. There’s not a lot of other stuff going on back there. No charging plug – an omission that drives me crazy. Our three children fit in the back comfortably, with no complaints regarding space. Two LATCH anchors allow for childrens’ seats to be secured. There’s a huge bin at the base of the centre stack with all the audio connections and a 12V plug. Pop open the adjustable armrest lid and you’ll find more space as well as another 12V plug. 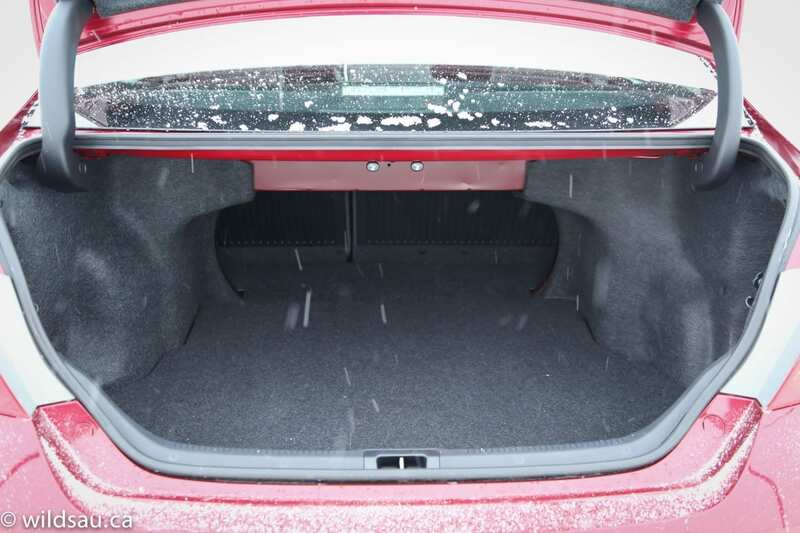 The Camry gets a large trunk (436 litres) and the rear seats can fold down in a 60/40 split, adding to the capacity. 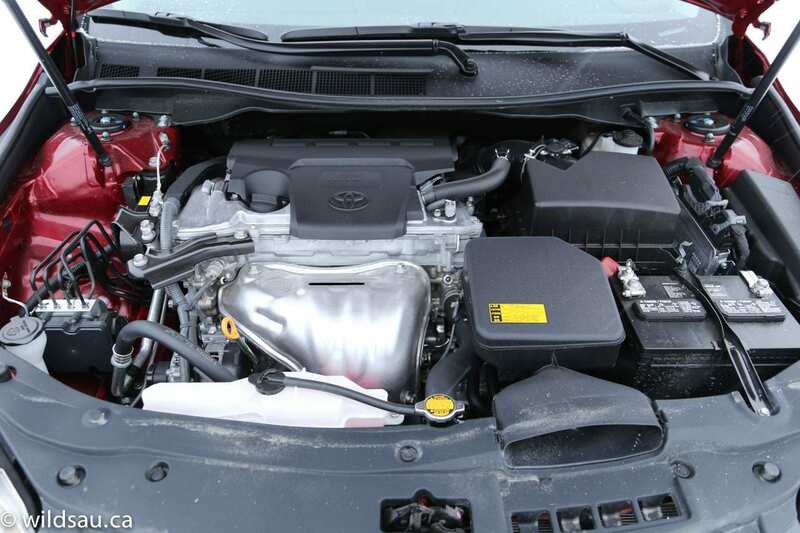 Toyota sent me the XSE with the bottom-rung 2.5-litre 4-cylinder. 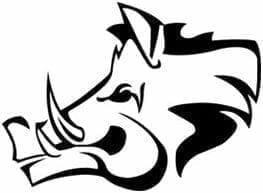 Numbers are less than exciting – 178 horsepower at 6000 RPM and 170 lb.ft of torque at 4100 RPM. 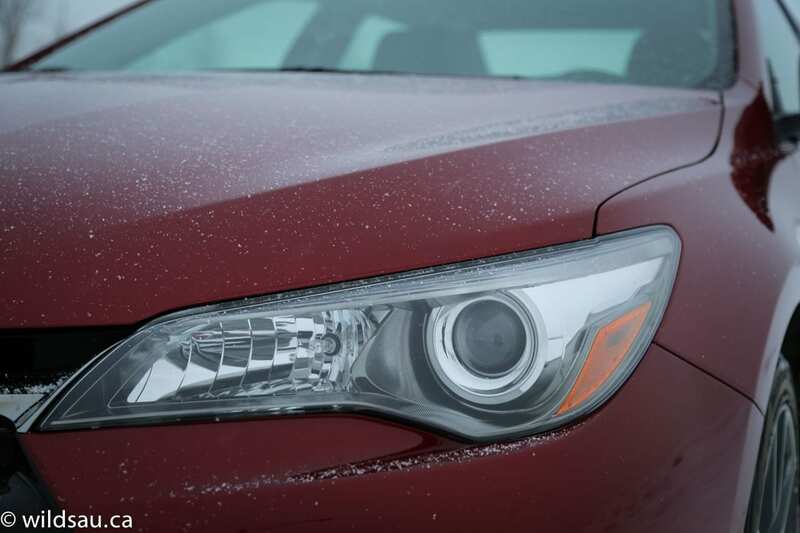 All Camrys (other than the hybrids) get a 6-speed automatic and they’re all front-wheel drive. The four-cylinder posts decent fuel economy numbers. Its ratings are 9.7 L/100 km (24 US mpg) in town and 6.9 L/100 km (34 US mpg) on the open road. I averaged 11.1 L/100 km (21 US mpg) driving almost exclusively in the city, slogging through bitter cold and fresh snow. Not bad, not great. I wondered how the smaller engine would do, trying to pull this 3380 lb (1493 kg) sedan around. I can assure you that it’s powerful enough in every driving situation. To be clear though, it’s not quite as entertaining as the V6, which has all kinds of jam. 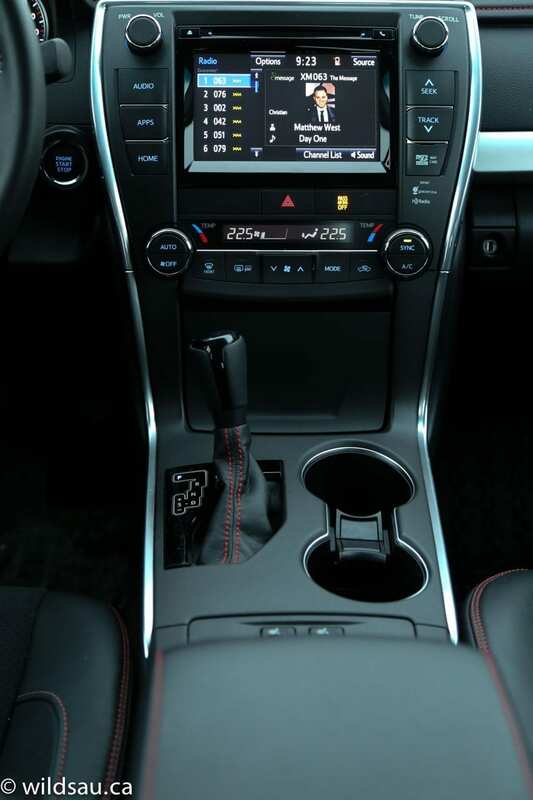 The smooth transmission has a Sport mode and gears can also be shifted manually using the paddle shifters or the gear selector. I felt the autobox did a great job, shifting slickly and usually being in the right gear. 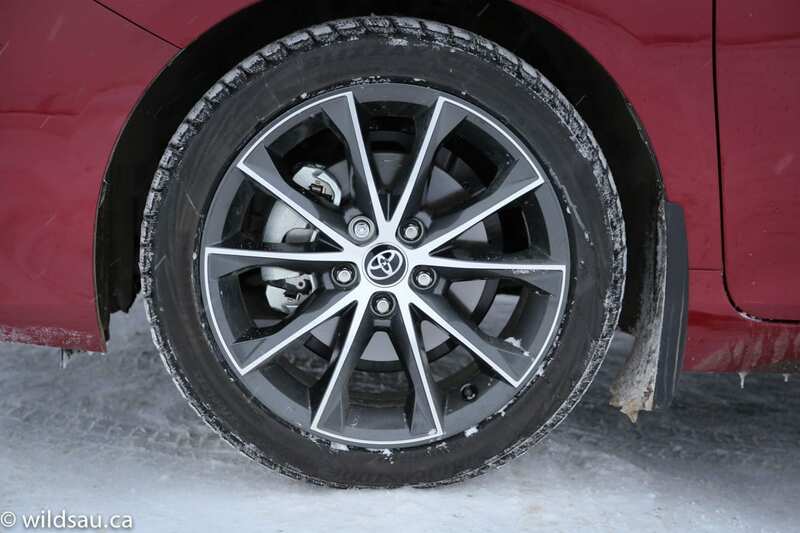 Toyota indicates the XSE model cranks up the driving dynamics. They’ve certainly made changes under the sheet metal to that end. A sport-tuned suspension includes new shock absorbers, firmer bushings, higher-rate coil springs and specially tuned steering. This all comes together to make the XSE quite capable in the curves. I’m not kidding when I say the Camry has found a bit of fun factor! Yes, the steering is still numb, but overall, for a sedan in this category, it’s great and a vast improvement. The XSE feels quite confident and even agile for a car this size. Of course, it’s still tuned for comfort, and you get a very good ride. 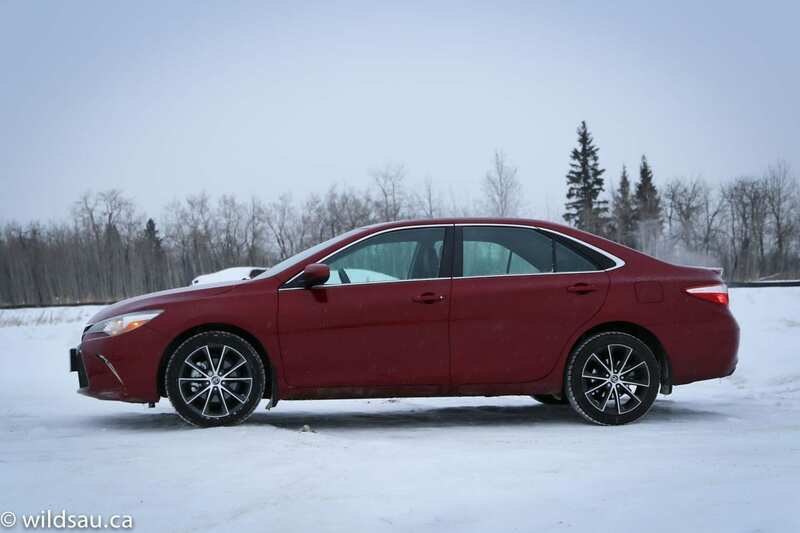 The manufacturer boasts that this is the “quietest Camry yet”. I was impressed by how quiet it really is. In terms of road, engine and wind noise, even at higher speeds – all sounds were isolated and kept at a minimum. 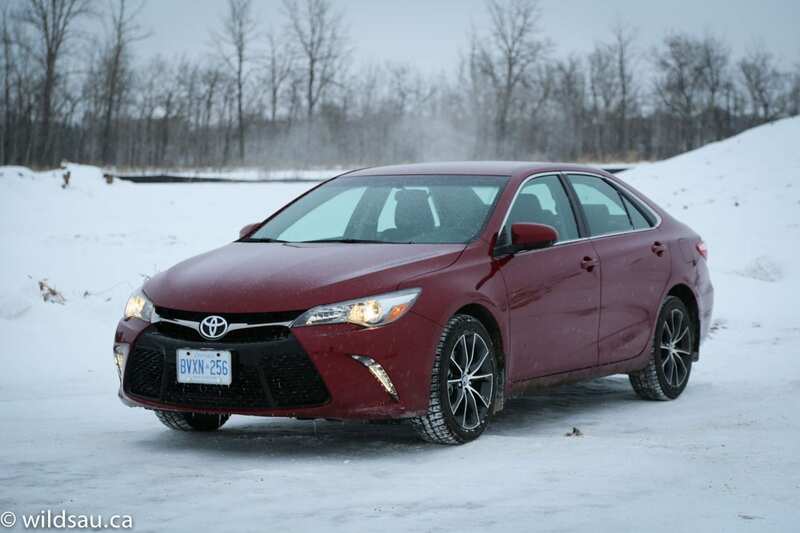 So, at the end of the day, how does the new Camry XSE fare? Pretty darn well, I’d say. It’s got enough power for every situation, it’s quiet, it’s spacious and well thought out, it rides nicely and it handles surprisingly well. What more could you ask for from a car? 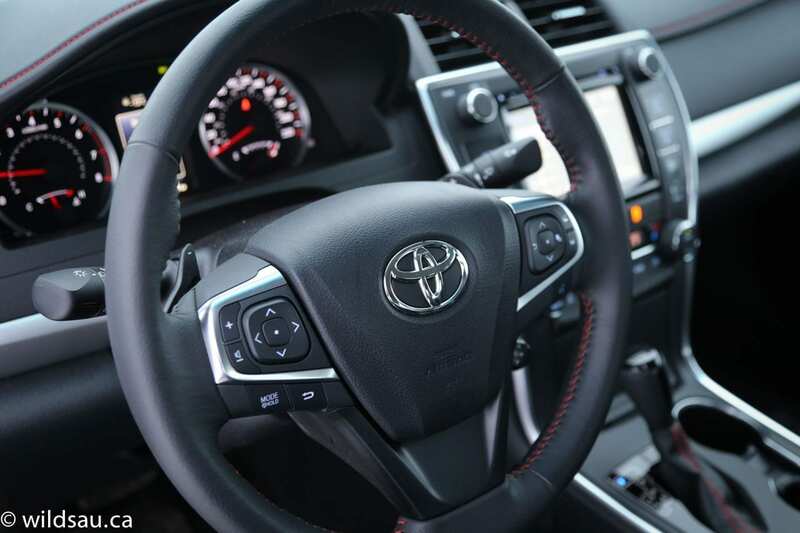 Add in Toyota’s expected reliability and a reasonable price, and you’re left with a vehicle that makes a lot of sense. WAF (Wife Acceptance Factor) was high. She felt it was super easy to drive and said that it just felt expensive. But the fact that the vanity mirrors are not illuminated did not escape her, and it loses big points for that. I’ve always thought Camrys made sense for those who don’t care much about the driving experience. The new XSE addresses much of that and adds a little fun into the equation, while maintaining everything that makes Camrys great. And hey, they even look pretty good! 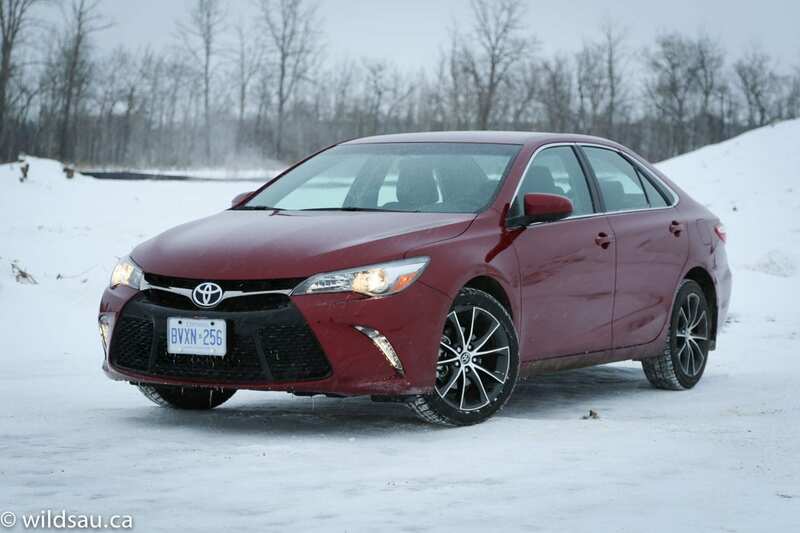 I highly recommend the 2015 Toyota Camry if you’re looking at mid-sized sedans.